It started in 2008. I was living in Argentina, and my buddy came to visit. We were at the border with Chile, and when our guide pointed to Mount Aconcagua and said it was the tallest mountain in South America, I boldly claimed that I could climb it. I got laughed at. Not a mean laugh — they meant no harm. Honestly, I was in no shape to take on the challenge. The reality of it hit me soon enough: we took a ski lift up a mountain, and after about ten seconds of running around in the knee-high snow, I was gasping for breath, absolutely gassed. 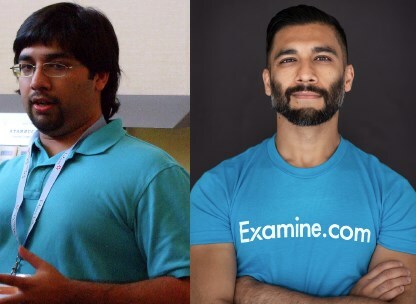 I co-founded Examine.com seven years ago because I was sick and tired of all the BS that supplement companies and health ‘gurus’ spread. They weren’t really interested in factual accuracy; nope, they were far more interested in their claims of a magic cure (and of course, in selling said cure to you). But you and I know this: there is no magic cure. Supplements are exactly that: a supplement to what we are already doing. As an engineer, I wanted to bring the engineering mindset to health and nutrition: let’s analyze the entirety of evidence, not just a study or two. I met Kamal (my co-founder) because we both suffer from Ehlers-Danlos Syndrome (EDS). EDS usually manifests itself as hyperlaxity (someone who is very flexible). But in extreme cases, it can cause highly weakened joints. I’ve had six major surgeries — for my jaw, shoulders, both ACLs, etc. It’s something I’ve learned to live with. In fact, I actually need further surgeries, but they are not impacting my day-to-day, so I’ve declined to go under. So to me, fitness is not just about getting muscular and “huge”. Every pound of weight gain is equivalent to an extra four pounds of pressure on your knees, so my losing 50+ pounds meant 200 pounds less pressure on my knees. It was my search for ways to manage my joint pain that led me to Kamal all those years ago: he was writing about how he managed his pain. We kept in touch, and our desire for a no-nonsense trusted resource is what drove us to found Examine.com. We wanted to bring nuance and context to an industry that so often lacks these crucial elements. We could never have imagined that our chance encounter in our respective quests to be fitter and healthier and feel good would one day yield the massive endeavor that is Examine.com. And that’s why when we assembled the Examine.com team, we invited people with a range of unique backgrounds that complemented one another beautifully. We were building this first and foremost for ourselves - to be armed with information to make the smartest health decisions for ourselves. And what a ride it’s been! We’re over seven years old. Tens of millions of people have visited us, and we’ve analyzed tens of thousands of studies. As the worldwide reference on nutrition and supplementation, we’re often asked by the mainstream media to provide expertise, thus helping combat the misinformation spread by less scrupulous media organizations. And since we’re driven by a spirit of inquiry and not by a desire to sell you supplements, you know we only offer honest and legitimate advice. I’m proud of what we’ve built with Examine.com. If you’d like to learn more about Sol, you can read his Wikipedia entry or visit his personal blog at SJO.com.